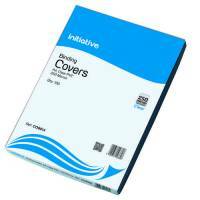 Initiative PVC Clear Cover A4 140 Micron 100s Pack of 1 A4. Initiative Cover A4 Plain White 100s Pack of 1 Gloss white card. Initiative PVC Clear Cover A4 250 Micron 100s Pack of 1 50 pairs / pack 100. 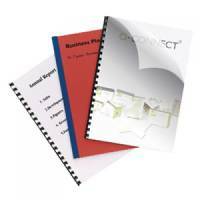 Q-Connect A4 White PVC Comb Binder Cover 250gsm (Pack of 100) KF00498 Pack of 1 Q-Connect gloss report covers. Can be used as a pair on their own or with Q-Connect clear PVC binding covers. 250 gsm. Pack 100. White. 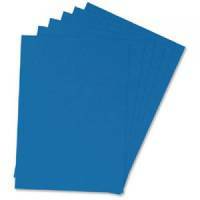 Q-Connect A4 Blue Leathergrain Comb Binder Cover (Pack of 100) KF00500 Pack of 1 Q-Connect leathergrain report covers. Can be used as a pair on their own or with Q-Connect clear PVC binding covers. 250 gsm. Pack 100. Royal Blue. 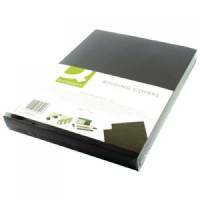 Q-Connect A4 Black Leathergrain Comb Binder Cover (Pack of 100) KF00501 Pack of 1 Q-Connect leathergrain report covers. Can be used as a pair on their own or with Q-Connect clear PVC binding covers. 250 gsm. Pack 100. Black. 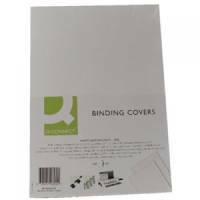 Q-Connect A4 White Leathergrain Comb Binder Cover (Pack of 100) KF00502 Pack of 1 Leathergrain report covers. Can be used as a pair on their own or with Q-Connect clear PVC binding covers. 250 gsm. Pack 100. White. 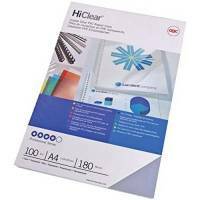 Q-Connect Clear A4 Clear Covers (Pack of 20) KF01946 Pack of 1 Q-Connect Clear Covers. Transparent single covers for protection, display and binding. A4 size and when used with slide binders create effective presentations and reports. 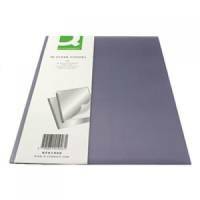 Q-Connect Clear A4 PVC Binding Covers 150 Micron (Pack of 250) KF24010 Pack of 1 Q-Connect PVC Clear Covers, ideal for all reports where the front page needs to be shown. Weight - 150 micron. 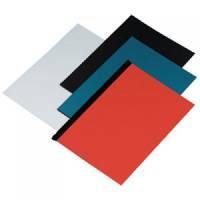 Q-Connect Clear A4 PVC Binding Covers 250 Micron (Pack of 100) KF24011 Pack of 1 Q-Connect PVC Clear Covers, ideal for all reports where the front page needs to be shown. Weight - 250 micron. GBC Leathergrain Covers A4 Black Pack 50 Pack of 1 Classic design: with the classic look of leather; leathergrain™ is one our most popular covers. GBC PVC Covers Clear Pack 100 Pack of 1 Clear finish: hiclear™ is a favourite choice when you need to display a title page with crystal clear clarity.